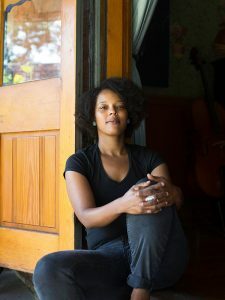 She is a published author, Pew Fellow, and Hedgebrook Writer-in-Residence who was named the inaugural Poet Laureate of Montgomery County Pennsylvania in 1999 and the third Poet Laureate of Philadelphia in 2016. Wisher taught high school English for a decade, served as Director of Art Education for Philadelphia Mural Arts, and founded and directed the Germantown Poetry and Outbound Poetry Festivals. She was the 2017-2018 CPCW Fellow in Poetics and Poetic Practice at the University of Pennsylvania, and is currently the Curator of Spoken Word at Philadelphia Contemporary. She plans to use her pier studio to expand her poetic practice beyond the page with workshops, jam sessions, and multidisciplinary collaborations. When she’s not at Cherry Street Pier, you can find her performing a unique blend of poetry and song with her band, The Afroeaters.